The alarm clock went off at 3:30 a.m. My hand flew up and knocked it off the nightstand. It was a cold and black-coffee morning in Lincoln City. Ron, a salty old prep cook with a nose like W.C. Fields and thick glasses, sat and waited for me in his rusty pickup. I tumbled out the door, threw my waders, pole and tackle into the back of his truck. We were off to fish for Chinook salmon. The Salmon River is 24 miles long and flows into the Pacific between Lincoln City and Cascade Head. Ron had a secret fishing hole just off Route 18 west of Otis. We geared up, waded in and threw out our lines. It was pitch dark and dead quiet as my legs and feet went numb. As the sun rose, the other fishermen began to appear. Ron’s spot was not so secret. At least three dozen people waded and fished. Fishermen shouted: “Fish on!” They reeled in their line, snagged big ones. The use of corkies and yarn left little to my success. I got skunked. Ron pulled in a beautiful 23-pound Chinook. If you are lucky enough to catch a salmon, eat it promptly or freeze it within two days to ensure flavor and quality. If you buy salmon, ask the fishmonger where it came from. Most farmed salmon is just not that tasty, and salmon farming destroys the environment and spreads disease to wild salmon populations. I recommend wild salmon. Don’t overcook the salmon, otherwise it will dry out. Keep the Rons of the world happy by keeping it moist and tender. 1) Line the sheet pan with foil. Rub foil with half the olive oil. Place salmon on the foil and rub with the rest of the oil. Sprinkle the salt and pepper evenly over the salmon. Zest the lemon with a micro-plane grater; sprinkle it evenly over the salmon. Save the lemon for juicing. 2) Place salmon in the refrigerator uncovered for one to two hours (the longer, the better). 3) Preheat oven to 400 degrees. 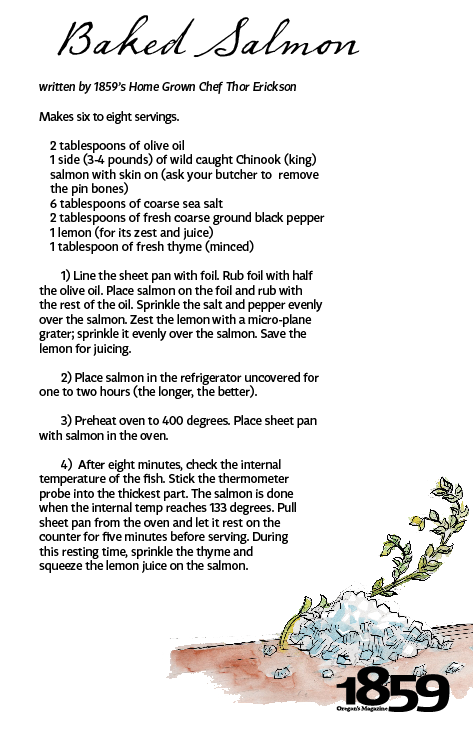 Place sheet pan with salmon in the oven. 4) After eight minutes, check the internal temperature of the fish. Stick the thermometer probe into the thickest part. The salmon is done when the internal temp reaches 133 degrees. Pull sheet pan from the oven and let it rest on the counter for five minutes before serving. During this resting time, sprinkle the thyme and squeeze the lemon juice on the salmon.